The International Whaling Commission (IWC) placed a ban on commercial whaling in 1985/1986. But Iceland, Japan and Norway have objected to the moratorium and continue to hunt whales. They set their own catch limits each year. Iceland proposed a 4 year “research study” with a stated objective of using the data to help calculate an effective quota system. They slaughtered a big number of whales between 1986 and 1989 before parting company with the IWC from 1992 to 2002. Rejoining in 2002 with reservations and caveats, they then embarked on another 5 year “research programme” in 2003, and then another “research programme” in 2009, though this one was interrupted by the catastrophic impact of the tsunami in Japan. Minke whales have been hit particularly hard by Iceland’s whaling policy. Surveys suggest that the population of Minke whales was 40.000 in 2001 and had halved to 20.000 by 2007. Whilst the huge decline is attributed to colder Arctic waters (global warming melting the ice caps), the Minke whale has enough environmental challenges without facing slaughter by humans as well. There is further evidence as stated by the Icelandic Marine Research Institute (MRI) itself, which confesses to a lack of understanding of the true numbers due to the complexity of analysing migration patterns. It could be argued that the MRI’s numbers are calculated guesses and yet, even when the calculated guess shows the population halving in 6 years, whaling still goes on……! The MRI proposed quotas for the deaths of 350 Minke whales in 2014 and 2015. If we speculate that the population has halved again like it did in the 6 years from 2001 to 2007, this means that humans deliberately are killing 4% of a species each year…… Amazing also that the quota has increased from 229 to 350 when the population is actually declining! The trouble is that tourists have been conned by whaler propaganda into thinking that eating whale is an Icelandic tradition and so they want to try it. Statistics show that around 2% of Icelanders eat whale meat whereas high numbers of tourists want to sample what they perceive to be a local delicacy. 40% of tourists sampled whale meat in 2009. As for the Fin whales, the International Whaling Commission (IWC) estimates that 50,000 live in the waters around Iceland and the Faroe Islands. The death quota for the last five years has been 770 Fin whales. The death quota this year is 154 fin whales and 229 minke whales. STILL TOO MANY WE THINK. Hvalur HF is the only company in Iceland who hunts fin whales, with 2 boats and 150 employees. Its CEO, Kristjan Loftsson, calls whales “just another fish in the sea” and refuses to stop hunting the endangered whales. Fin whale meat is solely exported to Japan and since there has been a radical reduction in demand some of Loftsson’s meat has been on ice for over two years. In his desparation to find new markets for this surplus whale meat, he has proposed it as sexual stimulants, as pet-food and has also promoted fin whale oil as an “eco-friendly bio fuel”. Gunnar Begmann Jonsson, owner of Hrefna HF, is the face of minke whaling in Iceland, and works with four minke whaling boats in Iceland, who independently hunt whales and sell the meat to Hrefna HF. 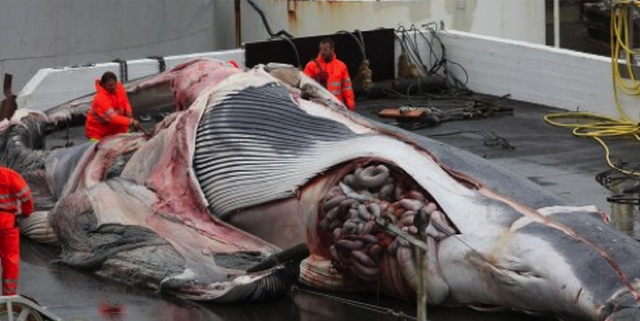 58% of Icelanders think that whaling should be allowed to continue!